Big Muddy Sessions: "A Walk on the Refuge"
Join Big Muddy Refuge staff for a short walk through the Overton North Unit of the Big Muddy National Fish & Wildlife Refuge. Followed by a discussion on the future of Friends of Big Muddy, the volunteer organization that supports the Big Muddy Refuge throughout the state of Missouri. 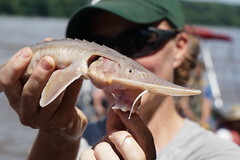 Also check out our Rocheport results page, with a trash tally, links to stories, photos and more. River Relief gets a Hummer! Well, we're calling it the "Hummer". 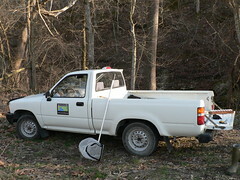 This generous donation, a Toyota pick-up, is already getting us around the state. It runs great, and we named it "Hummer" because Scott Mansker of Rivermiles called it a "Little Hummingbird". Big Muddy Presentations: "Missouri River Macro-invertebrates"
Tues, April 14, 2009, 7:00 p.m.
Missouri River Relief, Friends of Big Muddy and Big Muddy National Fish & Wildlife Refuge are proud to announce that our April 14 educational program will feature USGS River Studies biologist Barry Poulton, discussing the foundation of the Big Muddy food chain: the macro-invertebrates that inhabit its muddy waters.